ASDA Mobile is offering double data on their Pay As You Go bundles, including 6GB of data for £10/month. In the UK, ASDA Mobile is currently offering double data on their Pay As You Go bundles. 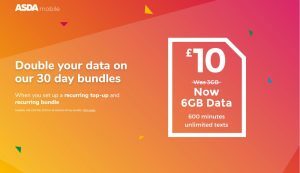 Deals available including a massive 6GB of data, 600 minutes and unlimited texts for £10/month. You’ll get high-speed 4G coverage from the EE network. The double data promotion is available until the 23rd May 2019, for customers who order a free ASDA Mobile SIM card and who then set up a recurring top-up and bundle on their account. 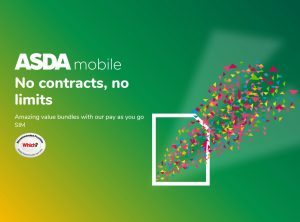 In this article, we’ll review ASDA Mobile’s line-up of Pay As You Go bundles and how you can benefit from the current double data promotion. We’ll also compare the new ASDA Mobile bundles to what is available on other mobile networks, before looking at the level of coverage you can expect and how to keep your existing phone number. As a time-limited offer, ASDA Mobile has doubled the amount of data that’s available on their 30-day bundles. The double data allowance is available to all customers who sign up for ASDA Mobile and who set-up a recurring top-up and bundle before the 23rd May 2019. 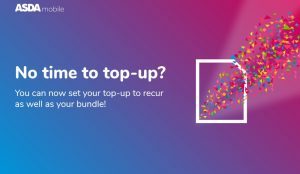 To benefit from the double data promotion, you should make sure you have a recurring top-up and recurring bundle set up on your account. 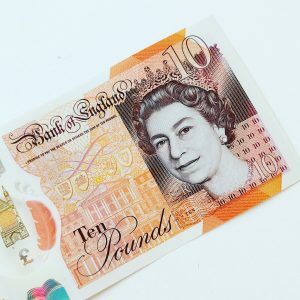 The benefit of doing this is it will also save you time in the future, as there’ll be no need to manually top-up your account and to buy a bundle every month. There’s also no need to undergo a credit check to use the service. If you’re not currently an ASDA Mobile customer, the best way to get started is by ordering a free SIM card online. Once you’ve ordered your free SIM card, it will normally arrive on the next working day. An automatic top-up on a specific date every month (e.g. every month just after payday). An automatic top-up every 7, 10, 14 or 30 days (e.g. typically every 30 days to match up with your bundle dates). You’ll need to save your credit card or debit card details on your ASDA Mobile account in order to use the recurring top-up feature. You’ll always receive a SMS text message to notify you 24 hours before a top-up is due to be taken from your account. You’ll also receive a SMS confirmation message once the top-up has been added to your account. The recurring top-up feature can be enabled by dialling 2732 on your ASDA Mobile handset. If you don’t want to turn your credit into a 30-day bundle, it’s also possible to use ASDA Mobile’s traditional Pay As You Go rates (8p/minute, 4p/text and 5p/MB). In this case, however, you won’t be able to benefit from the double data promotion and the increased data allowances that are currently available. With the double data offer, ASDA Mobile has some incredibly competitive bundles compared to rival mobile networks. For instance, at the £10 per month price point, you can get 600 minutes, unlimited texts and 6GB of data on ASDA Mobile. On other mobile networks, you’ll normally get only between 2GB and 3GB of data per month for the same price. For more information and for a full in-depth comparison, please see our guide to Pay As You Go bundles. ASDA Mobile offers 99% coverage from EE. ASDA Mobile uses EE as its network coverage provider. Customers on ASDA Mobile will therefore receive the exact same coverage as customers on EE. At the time of writing, this is 99% population coverage on EE’s 2G, 3G and 4G networks. 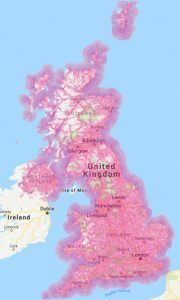 For more information, please see our in-depth guide about coverage on mobile phone networks in the UK. Tethering or personal hotspot refers to the process of sharing your smartphone’s mobile broadband internet connection with other devices (e.g. with your laptop or tablet). With ASDA Mobile, you can tether on Pay As You Go, either with or without a bundle. This means you can easily share your 4G connection with other people or with other devices whilst you’re out and about. This includes the double data allowance being offered by ASDA Mobile during their promotion. With ASDA Mobile, you’ll have access to an international roaming service when travelling abroad to other countries. If you’re travelling inside of Europe, you’ll be able to use your normal UK allowances at no additional cost. This includes the double data allowance, which can also be used when travelling in 50 other European destinations. A full list of destinations can be found in the ASDA Mobile guide to international roaming. If you’d like to take advantage of ASDA Mobile’s double data promotion, it’s easy to keep your existing phone number when moving from another mobile network. To do so, start off by ordering your new SIM card from the ASDA Mobile website. Your SIM card will normally arrive on the next working day. Once you’ve ordered your SIM card, contact your old mobile network and ask them to provide you with a PAC Code. This is a nine-digit code that you’re legally entitled to free of charge, and that enables you to move your phone number over to ASDA Mobile. When you receive your new SIM card from ASDA Mobile, you can provide your PAC Code to ASDA Mobile customer services. You can do this by calling 2732 on your ASDA Mobile SIM card, or by calling 0800 079 2732 from any other phone. If you like, you can also set-up your recurring top-up and bundle at the same time whilst you’re on the phone. Once you’ve provided your PAC Code to ASDA Mobile, your phone number will normally be transferred on the next working day. For more information about transferring your phone number between mobile networks, see our full guide to using a PAC Code. For more information about ASDA Mobile’s double data promotion, please see their official website.